Over the last ten days, there have been three significant announcements in mobile payments: Walmart Pay announced on December 10th, a report from Reuters on December 18th that Target Pay is in the works, and Facebook’s announcement on December 16th that you can order and pay for an Uber ride from within the Messenger app. While all these app-based solutions will likely enable Visa payment products, they profoundly change the relationship between the consumer and the Visa brand which will be wrapped by the brand of the app-provider. Our thesis is that this weakens the power of the Visa brand which, unlike most brands, is less about influencing consumer choice and more about restricting merchant choice (through rules requiring that transactions on Visa-branded cards must be routed over the Visa infrastructure) so as to support supra-competitive pricing for processing services. The specifics are that the legacy Visa model is built on leveraging the vertical integration of brand and processing to hold-up merchants and using the resulting economic rent to induce banks, via the interchange mechanism, to issue network-branded cards to their customers along with rewards; these rewards generate a flywheel effect of rising interchange by increasing cardholder insistence on the Visa brand and hence the effectiveness of merchant hold-up. However, the rules of the game change in an app-based ecosystem: instead of fighting for top-of-wallet by winning cardholders through interchange-funded rewards, banks must fight for top-of-app by winning merchant support. They do not need the Visa brand to do this as illustrated by JPM’s decision to launch ChaseNet. Indeed, they may not need the legacy networks at all given increased bank investment in the clearXchange or CX network and, share gains of private-label cards including Target RED debit and credit, and bank interest in working with the retailer payments consortium, MCX. In advancing our thesis, this note is also intended to serve as a primer on the competitive dynamics in network-branded payments with a particular focus on the linchpin role of the interlocking Visa rule-set: default interchange, honor-all-cards, mandatory routing, and anti-steering restraints. In 2000, Visa credit interchange was ~60 cents for a $40 transaction at a typical merchant; today, the Visa “premium” rate is nearly $1.00 (see chart below and sub-bullet). And debit interchange on the Visa-owned Interlink network was ~10 cents, a rate that had risen to nearly 50 cents by 2011 when it was Durbin-regulated to ~25 cents. Nobody argues seriously that improvements in the Visa service supported these increases; indeed, through its RED debit program accounting for ~10% of tender, Target now prefers that consumers write an electronic check. 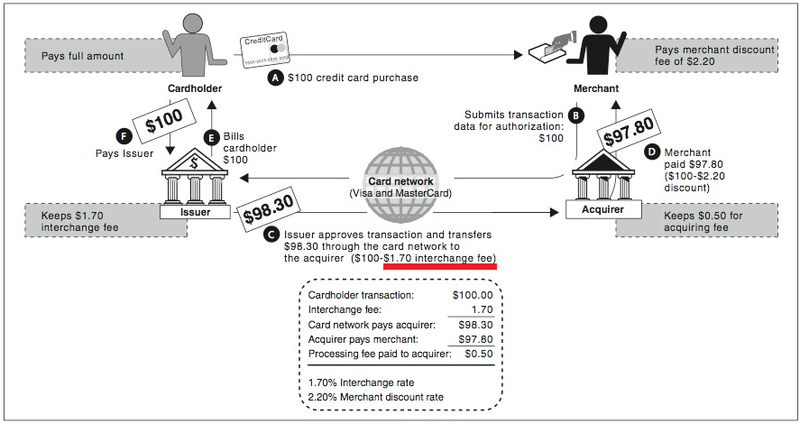 “Interchange” is that portion of the fee paid by a merchant for accepting a card payment which is credited to the “issuing” bank representing the consumer in the transaction; other portions of the merchant acceptance cost are the switch fee credited to the network, such as Visa, and the acquiring fee credited to the “acquiring” bank representing the merchant in the transaction. Interchange is by far the largest component of the merchant acceptance cost typically accounting for 90% or more of the total on a credit card transaction. At root, the Visa model is to hold up merchants and use the resulting payments to induce banks to adopt its brand: the strategy works because Visa has traditionally insisted that transactions acquired on Visa-branded cards must be processed or “routed” over the Visa infrastructure. The role of the brand, then, is not so much to influence consumer choice (since it is the bank that selects the network for its cards) but to restrict merchant choice and hence charge supra-competitive prices. The result is a self-perpetuating cycle of rising merchant acceptance costs: higher interchange to issuing bank -> more valuable rewards to cardholders -> increased consumer insistence on the Visa brand -> more lucrative hold-up of merchants. The vertical integration of brand and routing, and corresponding flywheel effect, keeps issuers bound to the Visa brand since the interchange it generates allows them to bid, through rewards, for pole position in cardholder wallets. The model has been undermined in debit since Durbin allows merchants to process transactions over any available infrastructure regardless of network brand. 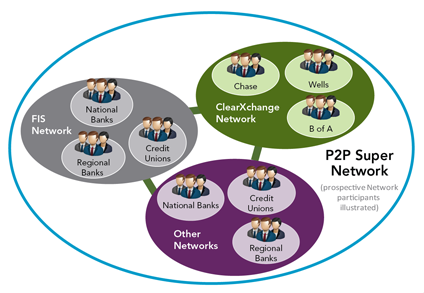 In part as a result, there is increased investment in alternative infrastructures including the clearXchange or CX network owned by large banks, FIS-owned PayNet, and various “direct-to-account” options. One direct-to-account provider is ACIW whose CEO, Phil Heasley (Chairman of Visa USA from 1996 to 2003), noted a transaction cost of five one-thousandths of a cent compared to the average network fee on Visa of ~nickel for debit and ~dime for credit. However, with the exception of ChaseNet, Visa maintains routing control in credit and recycles the resulting rent, through a complex system of rebates and incentives (now accounting for ~17% of gross revenue versus 15% in 2009), to support both debit and credit volumes. App-based payments mitigate the traditional frictions of private-label payment products around wallet and statement clutter. The payment becomes a behind-the-scenes element of the shopping experience with little to remind the consumer of payment instrument or prompt change from the default choice. Statements can be electronic and, if settled through direct debit, collapse to a single monthly entry on a bank statement. App clutter will be managed by beacon-enablement so that the relevant software pops to the home screen when a consumer enters a store. Retailers can outbid banks for consumer payments business since, after all, bankcard rewards are retailer-funded; furthermore, retailers can tap trade-spend (for manufacturer-funded coupons, for example) which runs at ~$200bn annually in the US versus $60bn for interchange. Indeed, Walmart Pay will likely improve the efficiency of trade-spend by linking point-of-sale scans of promoted product (provided to manufacturers by Walmart Exchange or WMX) to the identity of customers (provided by Walmart Pay, but not available in a standard card-swipe transaction). As a result of the shift in influence over tender choice, consumer adoption of app-based payments resets the balance-of-power between banks and retailers: instead of fighting for top-of-wallet by winning cardholders through interchange-funded rewards, banks must fight for top-of-app by winning merchant support. The merchants are the winners and, by extension, so are companies supporting merchants in enabling payments, such as PYPL, SYF, and FIS; the losers are companies that have traditionally supported banks in enabling payments such as V and MA. The favorable merchant terms of Chase Pay’s deal with MCX are illustrative; Gordon Smith, head of Chase’s consumer bank, commented “there is no network fees, no merchant-acquiring fees, we will not charge then back for fraud once we’ve approved a transaction, and we will also give them the opportunity to drive down further their cost of acceptance based on how much volume they do with Chase”. We do not view Walmart Pay or Target Pay as eroding the retailer payment consortium, MCX, which we expect will continue to provide a private-label debit option, in support of Walmart Pay and Target Pay as well as CurrentC, through its partnership with FIS and will dual-brand so that a private-label card registered to Walmart Pay can be used at merchants accepting CurrentC and vice-versa. The case for dual-branding is that it broadens the acceptance of private-label cards (given members of MCX account for ~one-quarter of retail spending in the US) thereby making them more useful to consumers and improving card-loan balances, and hence economics, to lenders. It is tempting to regard the announcements this month of Walmart Pay and Target Pay as just more clutter in the increasingly crowded mobile wallet space. But this is to miss the point that, as payments are integrated into app-based shopping, the payments experience will be branded by retailers not by networks, such as Visa, and banks. If this occurs, and we regard it as inevitable, then consumers will be steered by retailers to payment tenders that suit retailers rather than, as currently, steered by networks to payment tenders that suit banks. The winners will be companies supporting retailers in enabling payments, such as PYPL, SYF, and FIS, and the losers companies that have traditionally supported banks in enabling payments such as V and MA. This idea may need some unpacking. The legacy card payments business in the US was built on a bank-centric business model that was simple, effective, and unlawful: Visa and MasterCard held up merchants and, through the rewards funded by the resulting payments, won over cardholders. Cardholder insistence on these rewards made merchant hold-up more potent leading to a flywheel effect of rising merchant payments and rewards. The enabling mechanism is an interlocking set of rules established by the two networks around default interchange, honor-all-cards, and anti-steering. A baseline understanding of the payments landscape depends on understanding these rule-sets. “Interchange” is paid by the “acquiring” bank representing a merchant in a card transaction to the “issuing” bank representing the cardholder (Chart 1); acquiring banks, of course, recover the fees from their merchant customers. Interchange payments are enormous amounting to ~$1.70 on each $100 of spending on a typical credit card transaction and aggregating ~$60bn annually in the US; at Alaska Airlines, for example, credit card costs are approximately twice as high as US labor costs and more than the cost of food and beverages. Source: GAOs. Amounts are for an illustrative transaction and there are wide variations particularly in the acquiring fee. The chart does not show the network fee, paid by the acquiring bank to Visa and MasterCard, which is ~10 cents/transaction for credit cards. Interchange can be confusing because, while it is a payment ultimately from a merchant accepting a card for payment to the bank issuing that card, the default rate is set by Visa (or MasterCard). This is worth repeating because it is so unusual: Visa sets the default interchange rate on Visa-branded cards even though it has no direct interest in interchange fees which are paid by merchants to card-issuing banks. Indeed, for the period when Visa and MasterCard were bank-owned associations, the merchants challenged interchange as an example of unlawful horizontal price-fixing and their class action filed in 2005 against the networks and banks was settled in December 2013 for conduct relief and a $7bn cash recovery. Today, of course, Visa and MasterCard are stockholder corporations in the US so that their involvement in setting interchange is more unusual than potentially illegal; indeed, interchange rates on credit cards began to increase roughly coincident with the Visa IPO in March 2008 and have not fallen since – Chart 2. (In contrast, debit interchange rates fell by about 50% after a price-cap went into effect under the Durbin Amendment in October 2011 of ~25 cents/transaction versus the authorization-clearance-settlement or ACS cost for a median issuer of ~15 cents in 2013). Why do merchants put up with increasing credit interchange? The Visa and MasterCard networks set default interchange rates which can be overridden as a result of bilateral negotiation between issuing banks and merchants. In practice, however, issuing banks have traditionally had no incentive to accept an interchange rate below the default amount because of rules which demand that a merchant accepting any Visa- or MasterCard-branded credit card must accept all cards of that brand no matter which bank may have issued them and no matter what the interchange fee. These “honor-all-cards” rules create what the merchants refer to as a “hold-up” problem in that an issuing bank can demand whatever interchange it chooses to accept a transaction since the merchant is required to accept that credit card. For a Visa-issuer, the merchant alternative is to refuse to accept any Visa-branded credit card which is impractical because of the likely cost in lost sales given the need for pre-approved credit by some consumers and insistence on card-based rewards by others. We can gain some sense of the interchange impact of the honor-all-cards rules since, until 2003, they applied across both credit and debit cards: in other words, a retailer accepting any Visa- or MasterCard-branded card, whether credit or debit, had to accept all cards of that brand regardless of issuer, interchange, or whether credit or debit. In a class action filed in 1996, the merchants challenged this cross-product form of the rules as a violation of the anti-tying provisions of the Sherman Act, and Visa and MasterCard settled in 2003 for conduct relief and a $3bn cash recovery. The conduct relief restricted the honor-all-cards rules to applying within credit cards and within debit cards, but not across card types. This means that, today, a retailer can choose to accept Visa-branded credit cards but refuse Visa-branded debit cards; the cross-issuer requirements remain in place, however, so that merchants cannot accept the cards of one issuer but refuse cards of similar brand and type from another issuer. With the removal of the cross-product honor-all-cards rules, the gap between debit interchange on Visa-branded debit products and those carrying brands from competing networks such as NYCE, STAR, and PULSE, whose acceptance had never been tied to credit, fell from just under 40 cents to just under 20 cents by 2006 (Chart 3); the ~10 cents gap of 2003 arose because of Court-stipulated rates which expired on January 1st, 2004. From the merchant perspective, however, the settlement was unsatisfactory since the interchange gap between Visa and competing networks fell not because Visa lowered interchange on Visa-branded debit but because, led by the Visa-owned but not Visa-branded Interlink network, these competing networks raised their interchange rates towards that of Visa-branded debit. This provided the impetus for Durbin regulation of debit interchange taking effect in 2011 as discussed above. Why can’t merchants recoup interchange costs from consumers? Until 2010, when they were removed under a settlement agreement with the Department of Justice, Visa and MasterCard imposed anti-steering rules preventing merchants from attempting to influence the payment choices of their customers and, in particular, from favoring one card brand over another. This, of course, is very extraordinary. As the Court has commented “as a general matter, steering is both pro-competitive and ubiquitous [and] merchants routinely attempt to influence customers’ purchasing decisions, whether by placing a particular brand of cereal at eye level rather than on a bottom shelf, discounting last year’s fashion inventory, or offering promotions such as “buy one, get one free”; this dynamic, however, is absent in the credit card industry”. American Express also imposes anti-steering rules, applying not only to Amex-branded cards but also the brands of other card networks including Visa and MasterCard, and did not settle with the Department of Justice but rather took the matter to trial. The District Court ruled that the anti-steering rules were an unlawful restraint of trade in February this year and had them removed in July; however, as of Friday, Amex can once again enforce its anti-steering rules pending appeal. In practice, this means that the Visa and MasterCard settlement of 2010 is moot for Amex-accepting merchants. Merchants regard the anti-steering rules as a linchpin of card-network pricing power since they prohibit the use of price signals at point-of-sale to steer customers to lower-cost forms of payment. As the Court comments, “the rules prohibit merchants from adding a surcharge to a transaction involving either of the networks’ credit cards … thus a merchant who must pay a 2% interchange fee upon accepting a Visa or MasterCard credit card is prohibited from adding a 2% surcharge (or any surcharge at all) to either discourage the use of that card or to recoup the cost of acceptance.” Combined with the honor-all-cards rules, the anti-steering restraints support a flywheel effect for network-branded cards: merchants must pay higher interchange, which allows banks to improve spending rewards to cardholders, which increases the value to consumers of network-branded cards over alternatives, which increases cardholder insistence on these brands, which allows networks to raise interchange. With the consumer shift to smartphone-enabled “mobile” payments, the network-brand flywheel effect on interchange – positive for banks and networks and negative for merchants – is breaking down. Banks know this, and it contributed to the announcement in February 2013 of ChaseNet from JPM which CEO Jamie Dimon explained as a response to the Visa rule-set: “if you go to merchants, what they always complained about was ‘Visa’s got all these operating rules… why can’t we just deal with you directly?’ and now they can”. While ChaseNet may still rent the Visa rails (under a 10-year processing deal), it disintermediates the Visa brand. Brand matters. The traditional role of a brand is to reduce consumer search costs through establishing trust. Consumers trust that VW will deliver you a certain ecofriendly driving experience, or Brooks Brothers a certain cotton-quality of shirt, or Lagavulin a certain sense-of-place in a whiskey so that, at consumer point-of-purchase, the branded product can break through marketing noise. The brand-provider can violate that trust by secretly tinkering with emission controls or resetting the balance between quality and cost but at risk of losing default position in the consumer search-box and hence bringing revenue forward rather than accreting value; indeed, it is the self-defeating character of this brand-betrayal that reassures all but cynical consumers it will not occur. The Visa brand operates differently in that it is less about influencing consumer choice and more about restricting merchant choice of how to process or “route” a transaction. It is a matter of everyday experience that credit cards reach top-of-wallet based less on consumer preference for, say, Visa over MasterCard and more on consumer choice of bank and bank choice of network brand. While the networks look to influence consumer preferences, through MasterCard’s “Priceless” campaign and Visa’s sponsorship of sports including via the NFL and FIFA for example, these preferences are not so firmly fixed as to prevent banks from switching brands as illustrated most recently by USAA’s decision to shift from MasterCard to Visa. 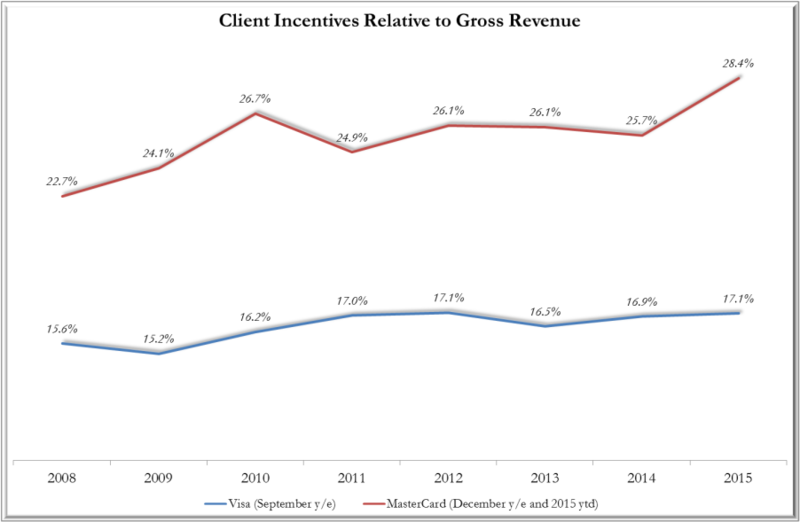 Indeed, the bank choice of network brand is less influenced by consumer preferences and more by B2B economics: in 2015, Visa has paid 17% of its gross revenue to banks as incentives while the equivalent figure for MasterCard is 28% – Chart 4. The majority of the incentives are paid to issuing banks so that these banks provide their customers with credit or debit cards carrying the network brand. The economic importance of this use of the Visa brand by issuing banks is that it restricts the processing or “routing” choices of merchants and hence allows for supra-competitive pricing: specifically, for many years, Visa insisted that a transaction acquired on a Visa-branded card had to be routed over the Visa network. Indeed, Visa litigated the matter so that a plan announced in 2001 by First Data to internally process Visa card transactions, and hence by-pass the Visa network and save network fees, in cases where First Data provided processing services to both the issuing and acquiring bank was abandoned in 2006 after Visa took legal action. However, incentives are increasingly paid to acquiring banks, and even directly to large merchants, because the mandated routing of the Visa brand is breaking down. Durbin, for example, allows debit card transactions to be routed over any available infrastructure regardless of the network brand. And, in agreeing to ChaseNet, Visa has allowed JPM also to route credit transactions acquired on Visa-branded cards over a proprietary infrastructure (albeit enabled by Visa systems). The fact that Visa-branded transactions can now be routed over alternative infrastructures has supported investment in these infrastructures. For example, ACIW CEO Phil Heasley (who was Chairman of Visa through 1996) comments that his company can process a Visa transaction for 5 one-thousandths of a cent compared to the nickel Visa charges on debit and dime on credit. In practice, the bigger threat to Visa debit may come from the large banks themselves who are collaborating on a competing infrastructure referred to a clearXchange or CX. The member banks of CX are BAC, JPM, WFC, COF, BBT, and USB and, in October, CX merged with Early Warning so as to integrate fraud risk management into its processing capabilities. The initial use-case for CX is person-to-person or P2P payments but CEO Mike Kennedy has been clear about his ambitions to expand this to B2C and government payments, and there are no technological impediments against extension to POS debit payments particularly if CX become interoperable with networks, such as PayNet from FIS, providing access to the checking accounts of non-members including regional banks and credit unions – Chart 5. Notwithstanding Durbin regulation of debit, and with the exception of ChaseNet from JPM, Visa maintains routing control in credit. This gives it market power in both credit and debit since it can recycles the resulting rent, through the rebates and incentives discussed above, to support volumes in both markets. The merchant response is to look to disintermediate the Visa brand altogether, and the customer shift to smartphone-based “mobile” payments provides the opportunity as evidenced by the development of CurrentC (from the retailer payments consortium, MCX), Walmart Pay, and Target Pay which we expect to roll-out nationally in 2016. As a result of the shift in influence over tender choice, consumer adoption of app-based payments resets the balance-of-power between banks and retailers: instead of fighting for top-of-wallet by winning cardholders through interchange-funded rewards, banks must fight for top-of-app by winning merchant support. The merchants are the winners and, by extension, so are companies supporting merchants in enabling payments, such as PYPL, SYF, and FIS; the losers are companies that have traditionally supported banks in enabling payments such as V and MA. The favorable merchant terms of Chase Pay’s deal with MCX are illustrative; Gordon Smith, head of Chase’s consumer bank, commented “there is no network fees, no merchant-acquiring fees, we will not charge then back for fraud once we’ve approved a transaction, and we will also give them the opportunity to drive down further their cost of acceptance based on how much volume they do with Chase”. Finally, we do not view Walmart Pay or Target Pay as eroding the retailer payment consortium, MCX, which we expect will continue to provide a private-label debit option, in support of Walmart Pay and Target Pay as well as CurrentC, through its partnership with FIS and will dual-brand so that a private-label card registered to Walmart Pay can be used at merchants accepting CurrentC and vice-versa. 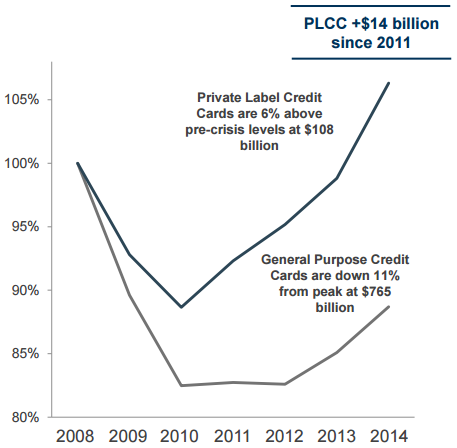 The case for dual-branding is that it broadens the acceptance of private-label cards (given members of MCX account for ~one-quarter of retail spending in the US) thereby making them more useful to consumers and improving card-loan balances, and hence economics, to lenders. ©2015, SSR LLC, 1055 Washington Blvd, Stamford, CT 06901. All rights reserved. The information contained in this report has been obtained from sources believed to be reliable, and its accuracy and completeness is not guaranteed. No representation or warranty, express or implied, is made as to the fairness, accuracy, completeness or correctness of the information and opinions contained herein. The views and other information provided are subject to change without notice. This report is issued without regard to the specific investment objectives, financial situation or particular needs of any specific recipient and is not construed as a solicitation or an offer to buy or sell any securities or related financial instruments. Past performance is not necessarily a guide to future results. The analyst principally responsible for the preparation of this research or a member of the analyst’s household holds a long equity position in the following stocks: JPM, BAC, WFC, and GS.